They changed the liveries and they seem to be reinforcing the age statements. Why would anyone be against all this? This is ex-bourbon Pulteney, probably young since there’s no age statement, finished in ex-peated casks. 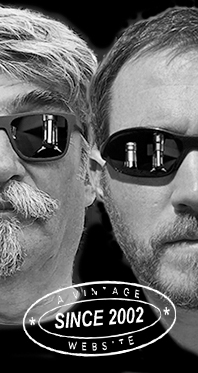 As for the ‘shouldn’t this rather be a blended malt then’ debate, we’ll do that later. Perhaps. Probably not. Colour: pale gold. Nose: they have a thing with these ex-peater finishes, because this works very well on the nose, really. Some apple pie that would have been baked near the ocean – or on a boat – while someone in the neighbourhood was burning lemon wood, whilst smoking eucalyptus cigarettes. Mouth: really, I find this surprisingly good. 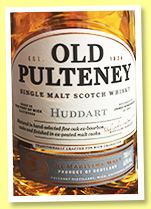 It’s as if Pulteney’s slightly coastal character was amplified, in a Spinal-Tap way. Some butterscotch too, toffee, charred US oak, salty lemons, a touch of ginger and nutmeg… All is very fine here. Finish: quite long, with a rounder texture (newish US oak indeed?) and a beautiful mentholy freshness. Comments: crikey, I seem to be enjoying this little NAS quite a lot. As for Huddart, that’s the name of the street where the distillery’s located, in Wick. Huddart St.
It’s meant to have been double matured in bourbon and Spanish, but it’s unclear whether that was successively or parallelly. Not that we desperately need to know. Colour: gold. Nose: really very lovely, not smoky this time, naturally, but really coastal, with the much advertised sea air well in place, while a bready side keeps it cereally. Sour dough, Ethiopian bread (yep, just tried that, it’s very fermentary). A little mint too. Like this nose a lot. Mouth: very good, just the oak’s a little too spicy/gingery for me, which gives it an ‘infused’ side that’s also to be seen elsewhere, especially at all the new crafties that are using new small casks. All the rest is pretty perfect, fresh, coastal indeed, bready, with hints of liquorice allsorts that will please all the kids within ourselves… Finish: medium, on just the same notes. Comments: very good. Not exactly my cup of malt because of the modern oak spices, but very good nonetheless. Same combination of cask types as in the 15, let’s just hope it’s not gotten even spicier, heavy-speculoos-style. Colour: gold. Nose: well, the answer’s no, it’s not any spicier than the 15, and actually subtler, with notes of pinewood coal (fusain), brownies, genuine chocolate, pot-pourri, wulong, and a little cigar tobacco, maduro style. Mouth: extremely good! A salty arrival, some camphory aromas, some angelica, gentian, a wee bit of pumpernickel for good measure, a touch of blood orange, and perhaps a drop of Aperol. Apologies (because we mentioned Aperol). Finish: long, perfectly balanced, with some roasted nuts and crystallised oranges. There’s a cake like that out there but forgot its name (now that was useful, S.!) Comments: we’re bordering the 90-mark now. Excellent drop, superbly made, with perfect control of some pretty active oak. Colour: white wine. Nose: exactly what I was looking for, some totally naked Pulteney, with barely any wood influence. We could call this ‘maritime melon spread on some toasted German bread’, were we working at the SMWS, God help them. Seriously, the coastal side’s very obvious in this context. With water: grassier, even a tad soapy. It saponifies after water’s been added but is extremely slow to get back to normal. Mouth (neat): very fresh, millimetric, first rather vertical (mentholated lemons, perhaps), then wider and fatter, with some butterscotch, lemon meringue, and perhaps ‘ideas’ of Cuban aguardiente. And why not? With water: very good, lemon curd, mint, baguette, malt, one wee winkle. Finish: same, with a little more earth. Comments: that’s what’s good with the main indies, they wouldn’t spend hundreds on newish oak.